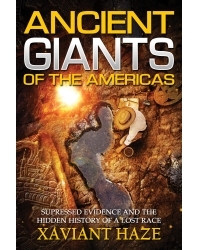 Did a race of ancient giants once inhabit the Americas? Do ancient megalithic stoneworks, out-of-place artifacts, DNA mysteries, and strange bones provide proof of their existence? How early pioneers discovered the remains of ancient giants and a previously unknown civilization—and how the Smithsonian successfully covered them up. Xaviant Haze is a researcher, teacher, and archivist of ancient manuscripts with a keen interest in lost civilizations, ancient aliens, ancient giants, and the myths of the prediluvian world. He is the author of 10 books, including The Suppressed History of America. XaviantVision.com, his free online library, is home to one of the most complete collections of metaphysical, spiritual, and alternative history books and podcasts in the world, with links and resources to all major works in the field. He resides in a haunted house in Miami, Florida.